A high quality range of screws ideally suited for use in all types of hardwoods, laminated boards, chipboard and fibre boards. Can also be used in plastics and UPVC. This type of screw has a sharp point angle of 35 degrees which allows easy and accurate starting on hard surfaces such as laminated and coated boards. This combined with a clean sharp thread ensures easy and fast driving of the screw as it cuts a thread into the material. 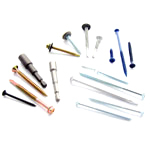 These qualities mean that this type of screw is easier to use in these given materials and is fast becoming the most popular type of screw in joinery and window applications. (Although there will always be exceptions to this). These screws are case hardened steel with a yellow passivated finish. Screw lengths up to 50mm are fully threaded and all longer lengths have 50mm of thread. Material grade is C1022 and is CSK recessed. For further information on Single Thread Chipboard Woodscrews or any other product, contact our friendly sales team on 0121 544 0055. To buy Single Thread Chipboard Woodscrews select the quantity required from the table below.